November was National Native American/American Indian Heritage Month, but it is always the season to honor and reflect upon the traditions, stories, and current events of the many different tribes who first called Oregon home, and who do so to this day. For non-Native educators whose own knowledge of the cultural diversity, heritage, and agricultural/resource management traditions among Native Oregonians may be limited, it is important to develop the skills necessary to identify culturally sensitive, responsive, and accurate curriculum resources. Shadiin Garcia, writing for Education Northwest, articulates the significance of informed, accurate, and responsible portrayals of American Indians in school curricula in her article: Steps Educators Can Take to Interrupt Narratives that are Damaging to American Indian and Alaska Native Students. Oregon’s agricultural history began with the Native tribes who managed the landscape and natural resources, such as salmon, camas, western red cedar, and wapato–to name only a few. Native organizations and individuals continue to play important roles in Oregon’s agricultural industries and resource management. 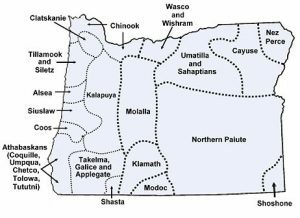 A diverse group of tribes call what we now recognize as Oregon home, and I highly recommend checking out this resource (Tribes of Oregon—Federally Recognized and non-recognized) to learn which groups are local to you, and what some of their specific traditions and contemporary land use practices are. I am not Native, and I am still very much learning when it comes to teaching indigenous histories, perspectives on agriculture, current events, and ways of knowing. My intent with this blog post is not to share my opinion or knowledge, but instead to amplify the voices of Native individuals and organizations who have created guidelines for separating the curricular wheat from the chaff, and to support Oregon educators in teaching about Native people and customs in Agriculture. Any resource I link to was either developed by, or in partnership with Native individuals and/or organizations. This resource describes itself as a “Native organization working to see that our lives and histories are portrayed with honesty and integrity, and that all people know that our stories belong to us. “ Even more useful than the numerous book reviews posted on the site is the resource evaluation tool provided by the organization. This tool helps non-Native educators watch out for the presence of stereotypes and the relegation of Native people to the past when deciding whether or not to use a resource in the classroom. Though not Oregon specific, this organization focuses on promoting Indian agriculture for the benefit of Indian people. 4th and 8th grade curricula developed by the Confederated tribes of the Grand Ronde (Kalapuya, Rogue River, Umpqua, Mollala, Shasta) covering topics ranging from treaties, to tribal sovereignty, to fishing and hunting. This middle school and high school curriculum was developed by the Oregon Department of education in conjunction with various tribal representatives. It is important to note that this resource focuses on federally recognized tribes, which does not include all tribes with a claim to what is now recognized as the state of Oregon. 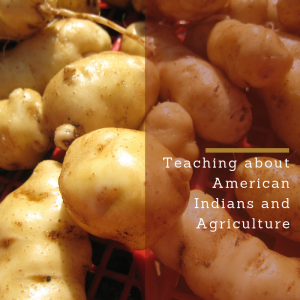 Oregon Harvest for the Schools has created resources for teaching about and growing the Makah Ozette Potato, a potato of cultural and culinary significance to the Makah tribe of NW Washington. Read about the traditional food ways of the Confederated Tribes of the Umatilla Indian Reservation. In addition to these resources, the Oregon Department of Education is looking to develop a general curriculum teaching about Oregon tribes. The plan is to provide funds to federally recognized tribes to create their local specific resources for the unit. Keep in mind that not all Oregon tribes are federally recognized, and that their experiences deserve space in our classrooms too. Remember, as Oyate suggests, keep your teaching hyper local, tribe specific, and emphasize the present. Happy teaching!